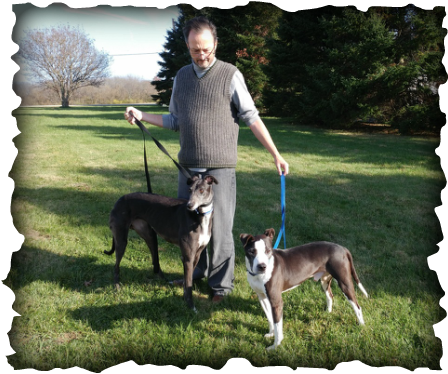 Dave of Waynesville had a greyhound until about three years ago. He's enjoying the company of his pit bull mix Lucas but felt it was time to add another greyhound to the family. Black and white Dutch Salena was the lucky choice and she and black and white Lucas make a good looking pair. Lucas is still getting used to the LONG legs on his new housemate but the two dogs got along great. Welcome to the GAGC family!